Anyhow, here we have my first finished summer outfit. I'm both amazed that I've actually done it and super pleased that I have. Of course my Washi top took all of fifteen minutes to finish. I hand-stitched the seam, catching it ever so carefully so you can't see the stitching from the outside and gave it a press. It's hard to see the detail on my Moss skirt because it's so dark. The fly worked pretty well although I would like to try it again with lighter fabric. The drill was so thick layer upon layer and my poor sewing machine didn't much like it. I didn't even try a button hole in the waistband. 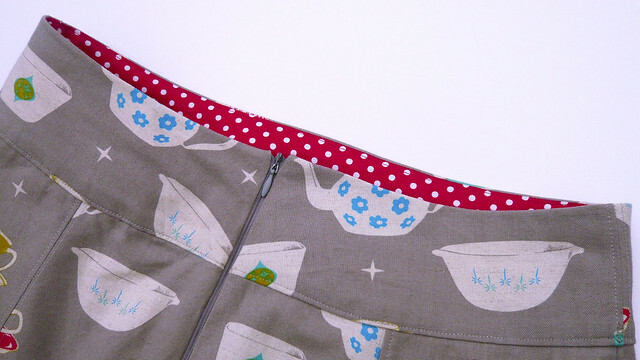 Instead I used a trouser hook and bar to hold the waistband closed. It's a groovy, comfortable wee skirt if you don't mind having all your legs on show. 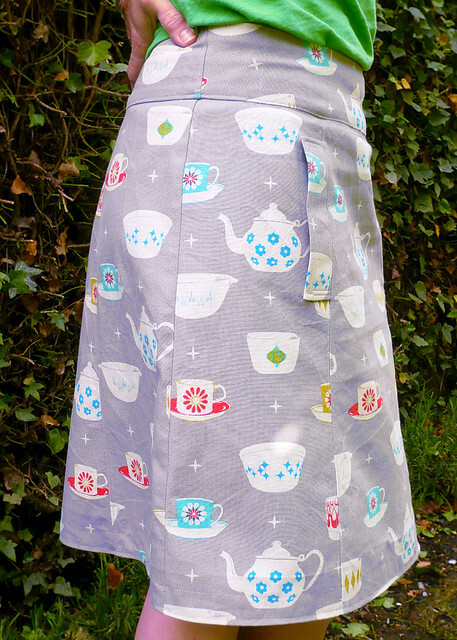 I made the shorter version of the skirt and I like the details such as the yoke at the back and the angled pockets. I didn't do any top stitching but I think I'd like to try some on another skirt. I did find however that the skirt came up a little large on me. I could have gone down a couple of sizes and took a chunk out of both sides before I attached the waistband. It wasn't the pattern - it was me. When trying to work out which size to make I found my waist measured four whole sizes larger than my hips. Worried that it wouldn't fit if I made the smaller size I cut out the larger one. 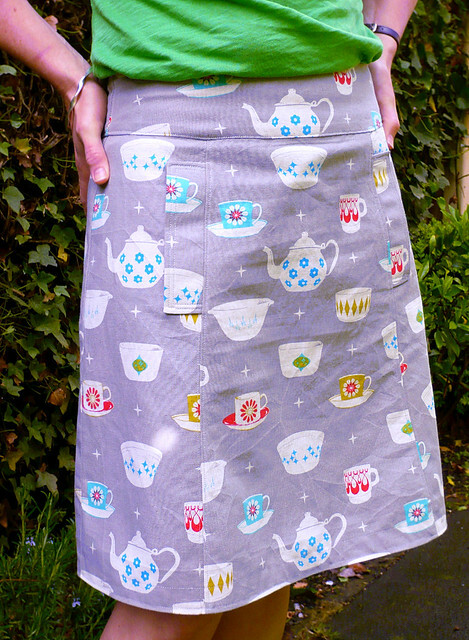 Now I've made the skirt I realise that it goes nowhere near my waist. It sits right down on my hips. Next time I'll go with the smaller size. My necklace is fun. I bought the beads on Etsy a couple of years ago and the black beads and leather cord were from my stash. I tried a couple of ways of string the beads. Initially I thought I'd string them simply on the leather but it wouldn't fit through the holes on the beads! 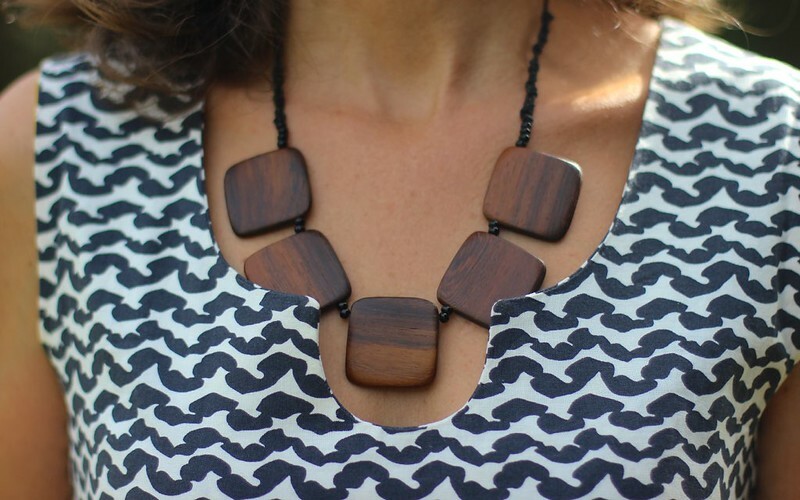 That's when I added the black beads, trying first one then two between each wooden piece. Two worked better and I added a couple more on each end too. 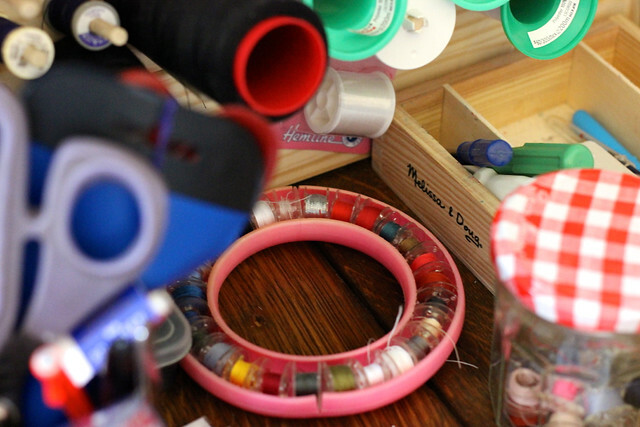 All the beads are strung onto some clear plastic jewellery "wire". I made a small loop at each end and tied my leather cord to each loop with a long tail so I could knot the cord for several inches up itself. The knots are slightly haphard and look a little like crochet. I'm the worst critic of my own creatiions. I wasn't sure about the necklace as I made it. Would it look ok? Would it look totally amateur? I tried to look at it as if I was viewing it in a shop. Would I like it then? In the end I decided I would, in a "tribal" meets "urban" sort of way. Well, I'm so pleased that I've finally got something new to wear this summer. Let's hope the good weather stays around for a while because I'm itching for more summer clothes now! You know that little voice inside your head? The one that says things like "this isn't going to work", or "it's really not going to work", or "why are you still doing this? It isn't going to work..."
Why don't we listen to it straight away? Why do we push on and on, until the little voice becomes louder and louder, and then shouts "STOP! IT'S NOT WORKING!"? Daughter (9): "Mum, everyone is going to see your skirt and think: she's got no taste, then never read your blog again." Ah, kids. They're a humbling experience. 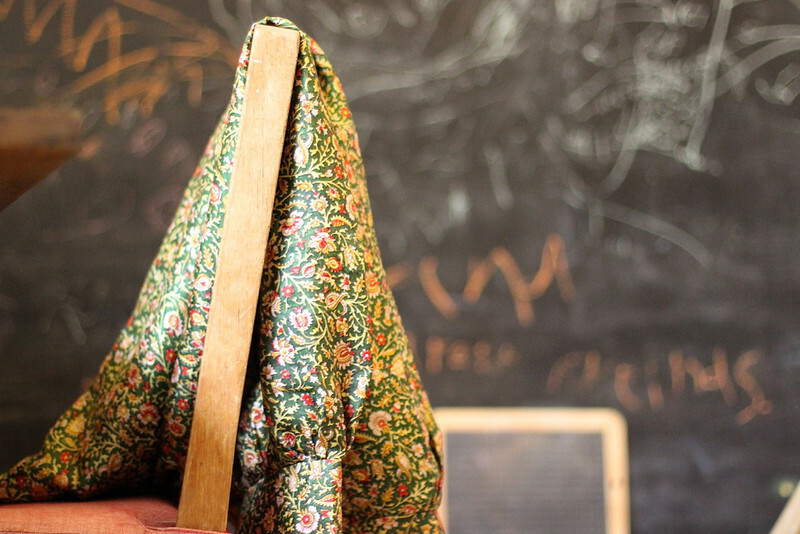 Of course, the fabric was beautiful and the pattern is a goodie. So what went wrong? First, I didn't appreciate just how fragile this second-hand sari was. It had a big repair that I noticed immediately, but it wasn't until I laid it out and started cutting into it that I saw several small repairs and a bunch of tiny tears. Oh dear. I carefully tried to cut around them but that meant I couldn't cut it as full as I'd have liked. And, after cutting one piece out, I picked it up and it pretty much ripped to pieces in my hands. So, in the end I didn't have enough for the skirt and the lining, and I had to use some green lining instead. Second, I made the mistake of trying to change the pattern so that it was gathered instead of pleated at the front, without thinking it through properly. I should have thought about how the fabric was going (or not going) to fall, and about the shape of my body. My waist, or lack thereof, particularly. It was around about then that my dear daughter made her not very complimentary comment. To be fair, she was absolutely right. The gathers stuck out from the waist rather like a 360 degree bustle and gave me the appearance of someone who dresses wholly for comfort. Not quite the look I was going for. You can imagine how loudly the little voice in my head was shouting by now. But did I listen? No, of course not. Instead, I thought I'd tackle my skirt in the morning and spent the night having bad dreams about it. I woke, almost decided to pack it in, but then rather irrationally changed my mind, deluded that it was salvageable and ploughed on. The crunch came after I'd carefully joined the lining and the outer fabric together along the front panels and sewed on the waist band. I held it around myself in front of the mirror. It didn't meet at the front ... The little voice in my head said "told you so" and I pulled it tighter. Nope, there was no way it was going to reach around my waist, not if I wanted to breathe at the same time. No way. You see, the fabric at the waist had seemed to stretch and stretch. I measured regularly and after worrying that it was going to be too big, I sliced a strip off each side before I sewed the side panels down. That turned out to be a mistake - I needed those inches of fabric. The beautiful sari skirt is not going to happen. I'll try to figure out another use for it because I can't just throw it away. Who knows, it might end up as a cape in the dressing-up box. It'll likely rip to bits in the first battle. 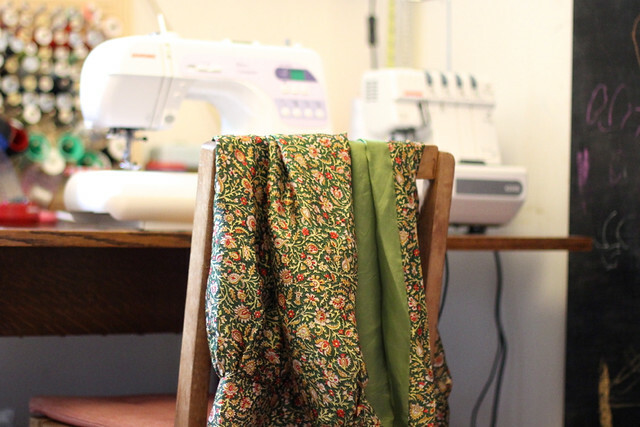 And, because it's boring showing you pictures of a not quite finished, disaster of a skirt, I've given you a peek at my "corner". 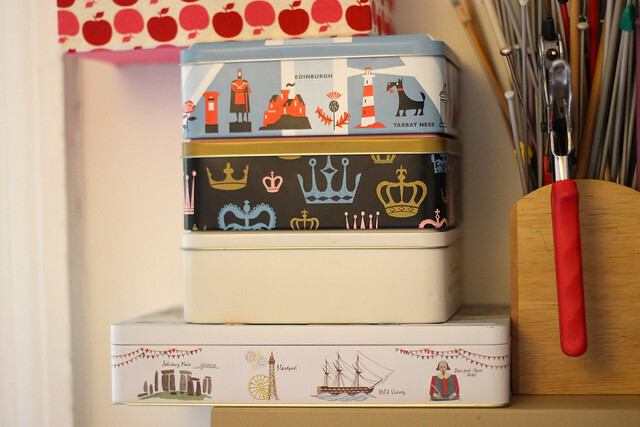 I'm fond of tins and they're useful for holding zips and elastic and other bits and bobs, but I hope you're not disappointed that my space isn't stylishly adorned or terribly pretty. This is the real McCoy, a working corner. Actually, it's not normally so orderly. I usually get into quite a pickle when working on a project. 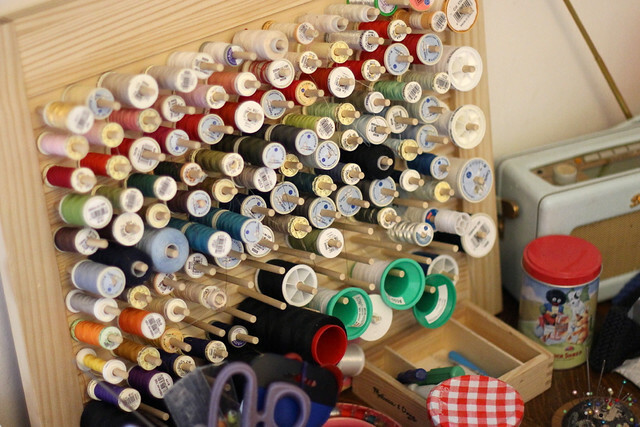 But, I was overcome with an urgent need to tidy it last weekend after I had to relinquish my big table (it's our outside dining table over the summer) and after Mr Myrtle finished my cotton reel holder. See it at the back? I love it. It's not on the wall yet, just propped up and it'll probably stay that way for ages to be honest. But, back to business. After my skirt disaster and some huffing and puffing, I was feeling a little weird. Not to mention a little freaked that I still had no skirt and only a week till the end of the month. Gracious. You won't miss me coming. I'm sorry to go on and and on about the weather, but you know, this is England... 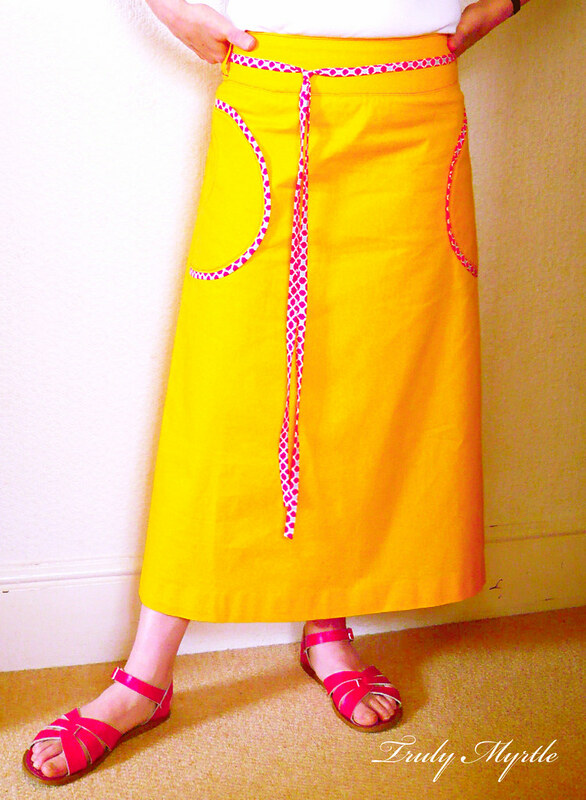 Anyway, it's still been gloomy and in desperation, I issued a challenge to the sun by making an electric yellow skirt. 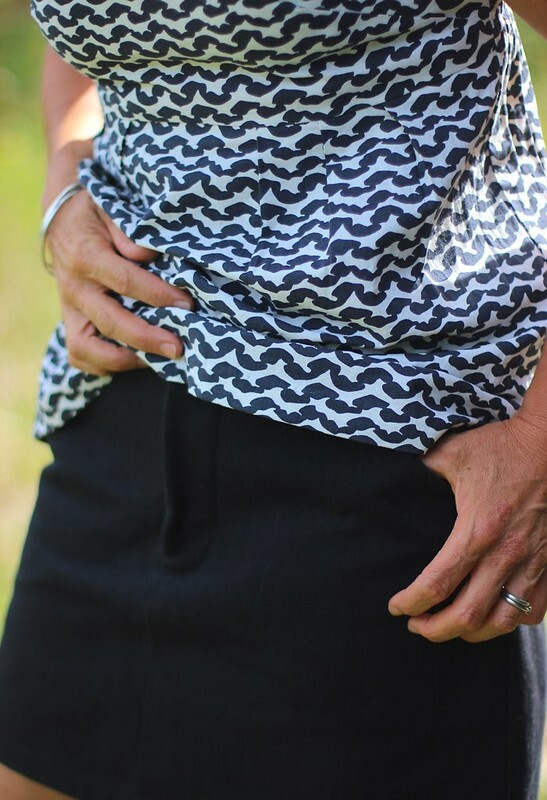 A skirt that can't help but make you feel good. I'm loving this 70's throw-back look. 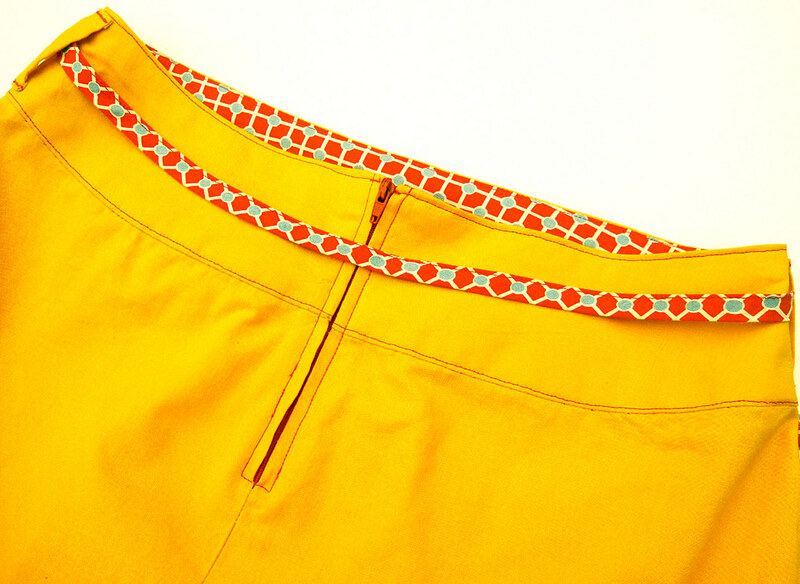 Big, bold, unashamed blocks of colour, round pockets, big belt loops, red top-stitching and a long A-line cut. 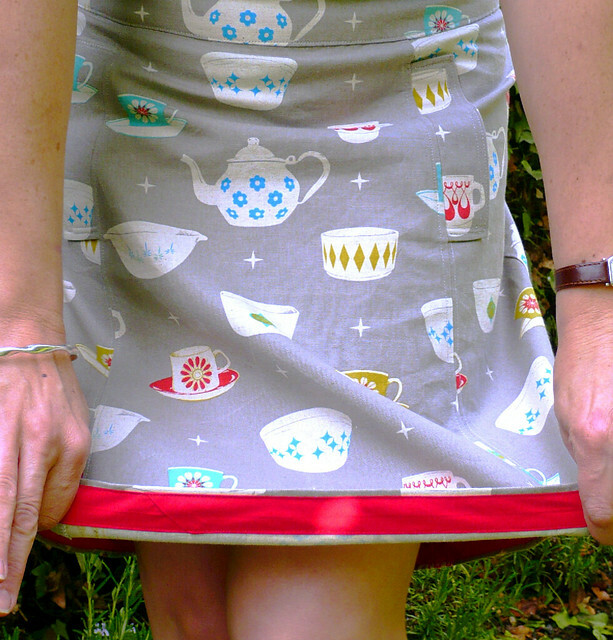 Like my tea party skirt, the fabric is from Ray Stitch. 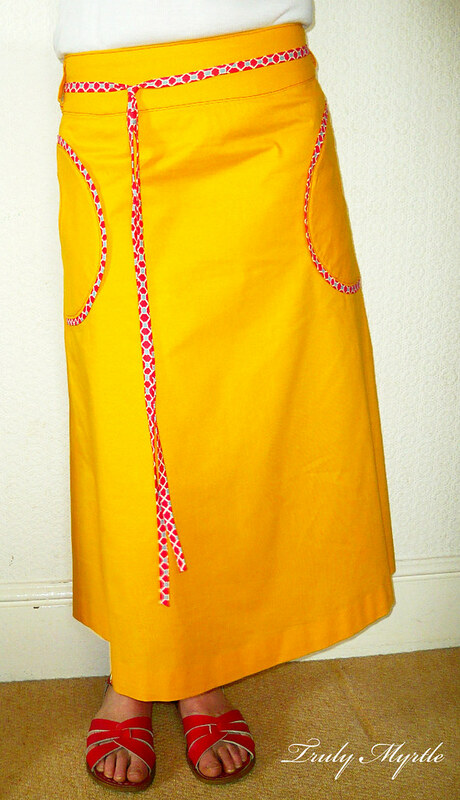 The yellow is a Klona woven cotton, in the Corn Yellow colourway and I'm pleased that it's made right here in the UK. The funky red, white and blue patterned trim is also cotton, it's called Red Grid and is from the Pinelope range by Anna Griffin. 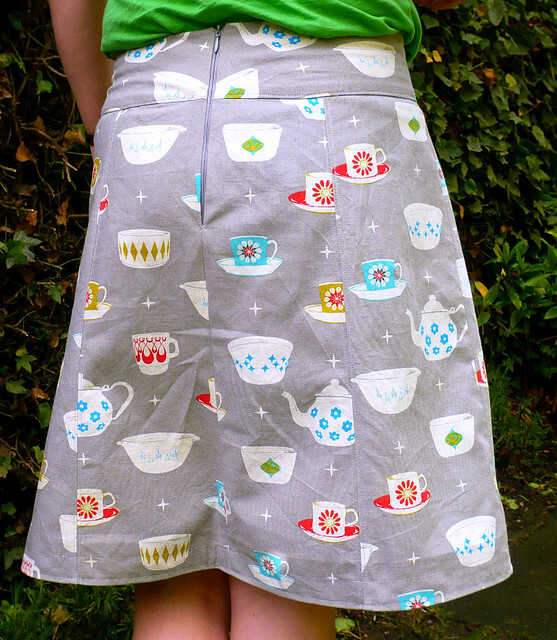 I've used the same pattern as for my tea party skirt, Simplicity 2152. If it's not recognisable as such, it's no wonder. I adapted it pretty significantly. I used the same yoke because I was so pleased with the fit of my other skirt, but cut out the front and back without the panels. To do that I lay the front panel pieces side by side, overlapping them at the top so they were the same width as the yoke piece and gently tapering them away from each other towards the bottom. I cut round them as if they were one piece. I did the same with the back and made both longer. I'm super proud of the pockets. They're patch pockets, although sewn into the side seams, and they're lined with the red print and top stitched. I drew the general shape I wanted onto baking paper and then cut it out in the yellow and the print. Then I sewed the right sides of the fabric together along the curved edges, sandwiching the piping between them on the longer curve. I found a great tutorial for flat piping here. 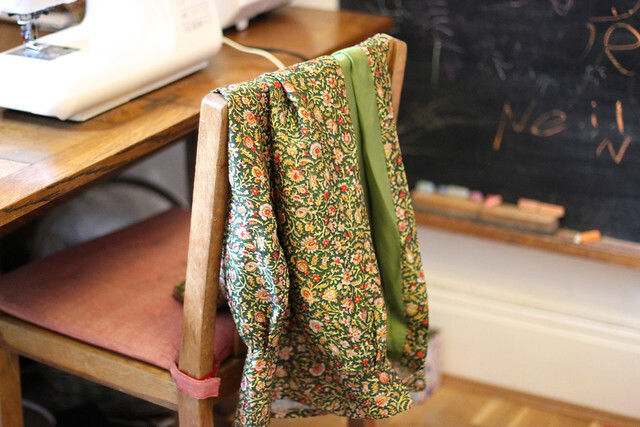 Once turned right sides out and gently pressed, the round, lined pocket was ready to sew onto the skirt front. 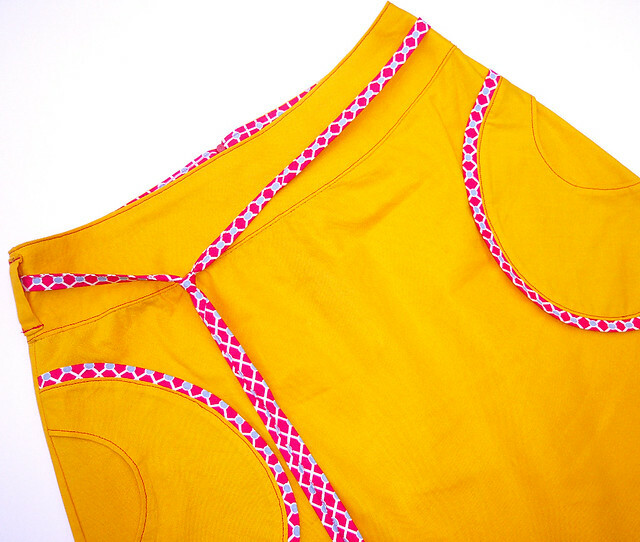 When the front and back were sewed together, the sides of the pocket are secured in place. The second pocket is a mirror image of the first. 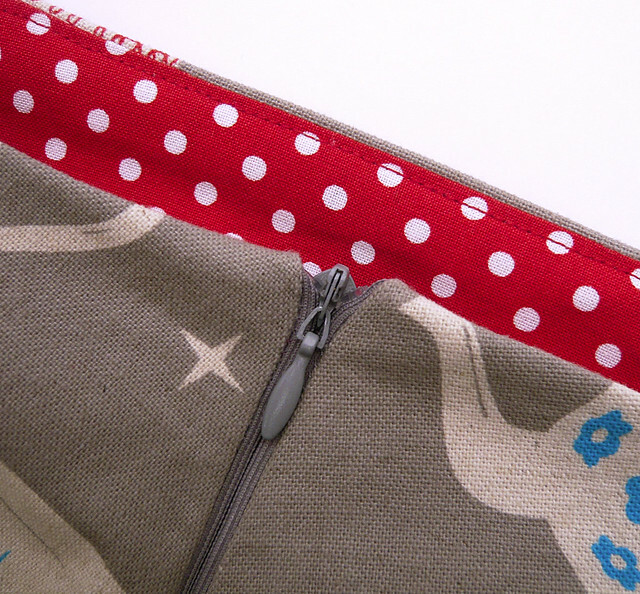 The zip is a cheery red that peeps out at the back and I've lined the yoke with the red pattern. I found a great idea for the zip here. Instead of lining it up at the top of the yoke, I overlapped it a bit, zipped it right up, and so avoided getting a wiggly stitching line around the fastening part. 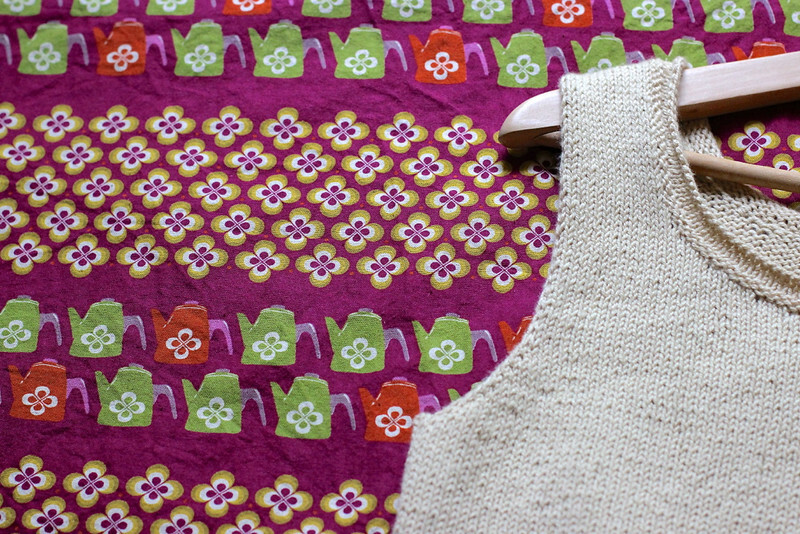 I then zipped it down, folded the top of the zip down and now it's neatly encased in the yoke. The tie just makes it I think - it was Zoë's idea! I showed her the skirt semi-completed and wondered out loud what it seemed to need ... something else ... "A belt" she said. And it was, though perhaps not the belt she had in mind. I attached belt loops to the yoke before I added the lining so there's no visible stitching inside and made the tie from lengths of the red print cut on the cross. It has a sliding tie knot to move it up and down so I don't have to undo it to take my skirt on and off. It's still raining and quite chilly here in the UK. In fact, today we had hail! But, I've tried to ignore it and have begun preparations for warm, sunny weather. Don't be fooled by the photos, I was back in my leggings and cardy the minute we were finished. 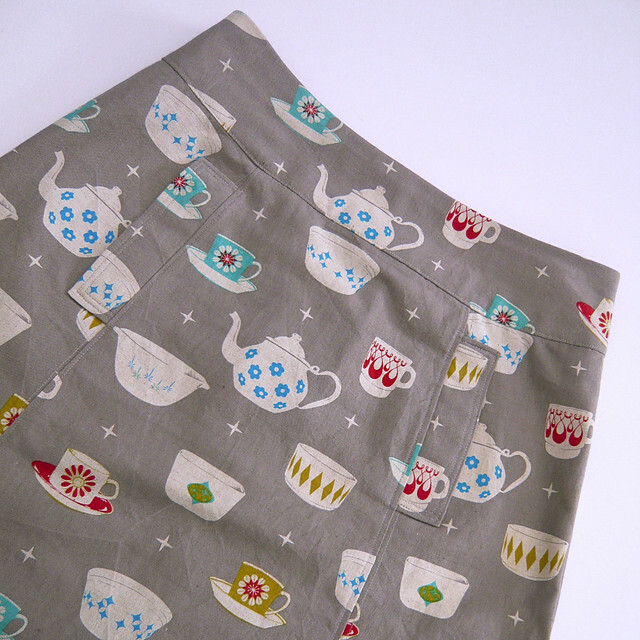 I picked up the fabric for this cute skirt at the very lovely Raystitch in London a few weeks ago. What a fab shop! 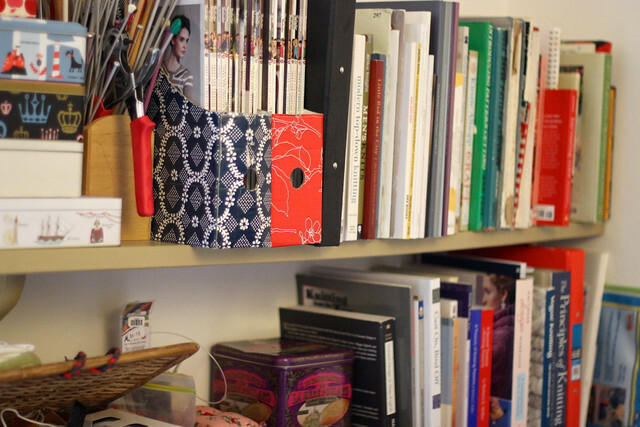 It's a wee treasure trove. Super duper trendy, with low hung lights, a big coffee machine and yummy cakes at the front, and shelves and shelves of glorious fabrics I'd only read about and seen on-line. Venture downstairs, and you'll find even more. We had taken the kids to the British Museum and afterwards Mr Myrtle suggested that I might like to visit the fabric shop I'd mentioned. Oh, did I ever! He knows me so well. So, we hopped onto a bus and dragged everyone across London to our old haunt, Islington. 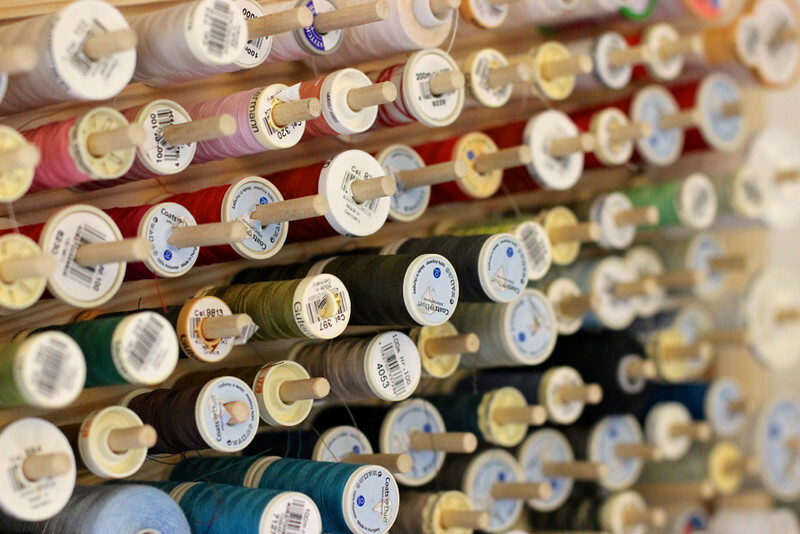 To top it off, Loop is only down the road, and of course we had to have a peek in there too.... and buy a little more yarn, but I'll tell you about that another day. 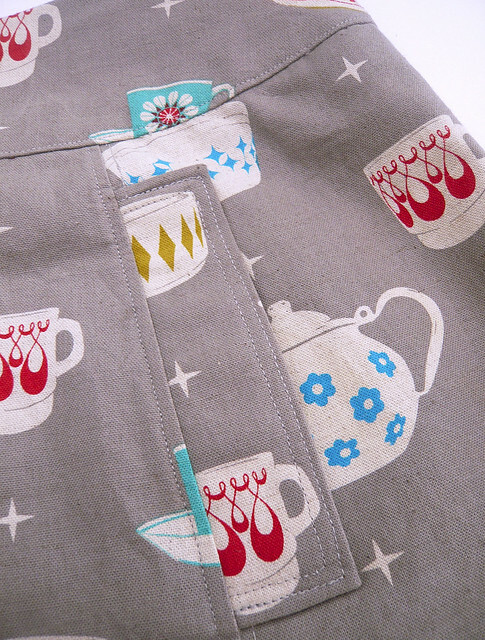 I just fell in love with this tea party fabric. It's Ruby Star Rising by Melody Miller in the grey colourway and is a fabulous weight and grainy texture. I bought a metre and crossed my fingers. I was still crossing my fingers when I laid the pattern pieces onto my fabric, freshly washed and ironed. 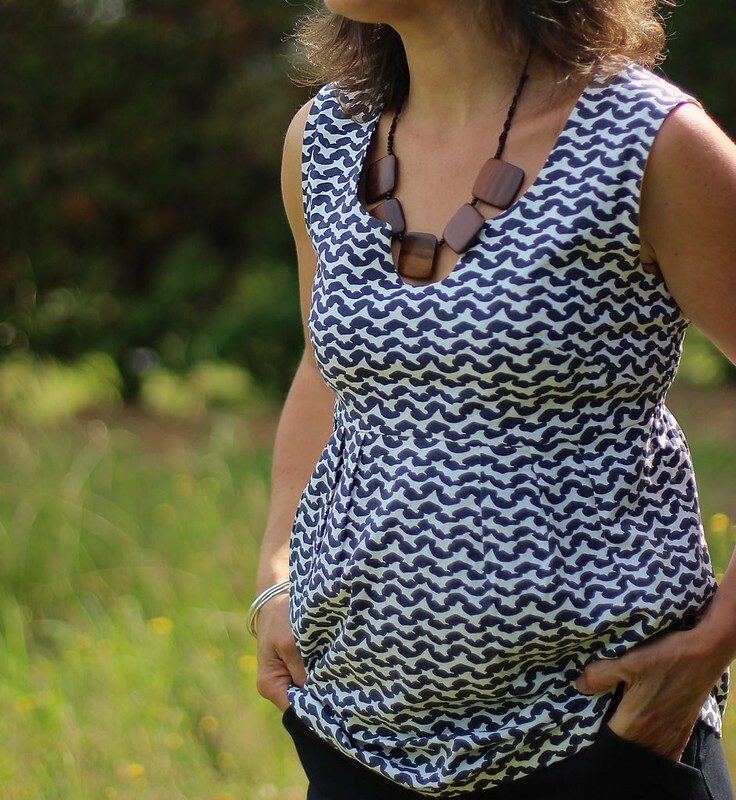 I've used a pattern, Simplicity 2152, and loosely followed version D with its funky faux pockets. 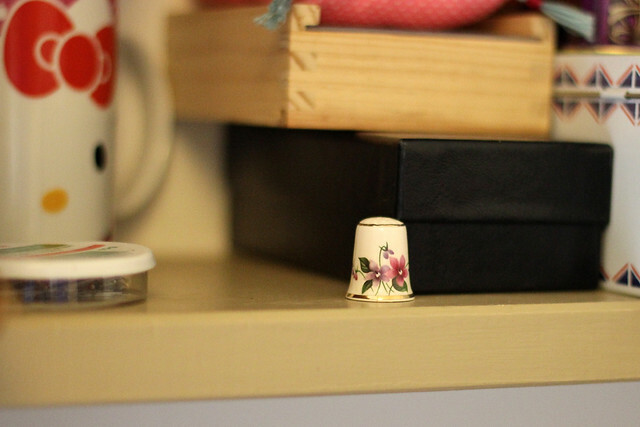 It took a bit of jiggling around to get it out - I didn't want upside down cups and saucers - but I did it, just! In fact, I didn't have enough for the yoke facings or a decent hem so I had to improvise a little. The spots were a tiny piece left over from Zoë's American Sportswear hat. They're a nice surprise inside, it's a fun skirt after all. I under-stitched the spotty yoke facing so that it lies nice and flat and then carefully sewed it down by hand down the sides of the zip and along the bottom. The hand stitching didn't take long, and it gives a clean finish. And, I made the most of the fabric by using the left over bias binding from the birthday placemats for a false hem. 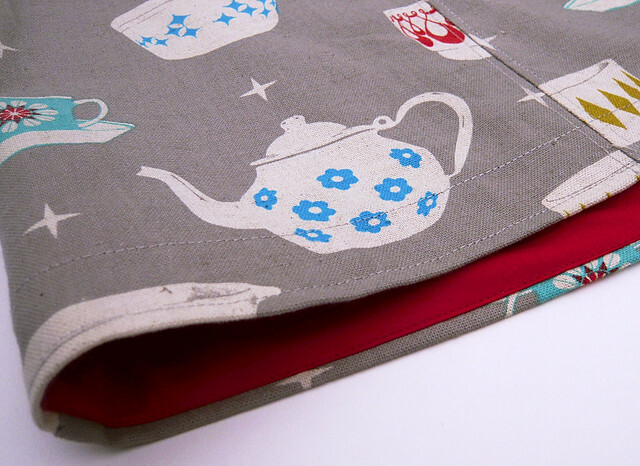 I ironed it flat and sewed it over only a very small fold in the teacup fabric. I love how the stitching matches the grey and the red, and to do this I popped red cotton onto the top of my machine and grey into the bobbin. The zip is supposed to be invisible - but clearly it's not! It's been a long time since I put in an invisible zip and I've forgotten how to do it with a regular zip foot... and I was too impatient to look it up... next time! Now, be impressed. 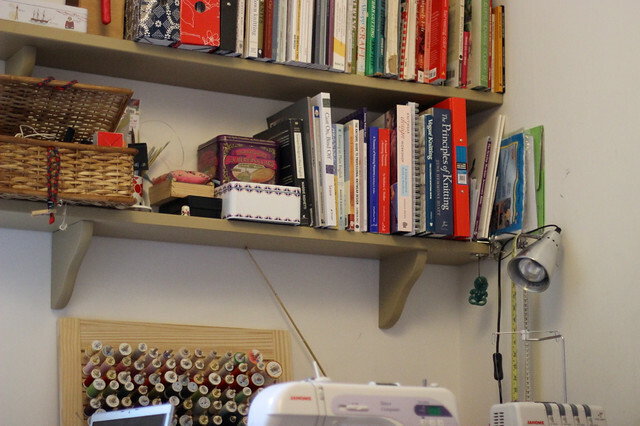 My sewing machine is throwing a wobbly. It won't always stop when I lift my foot off the pedal and often speeds up to supersonic speed instead. I have to madly switch the machine off to get it to stop! 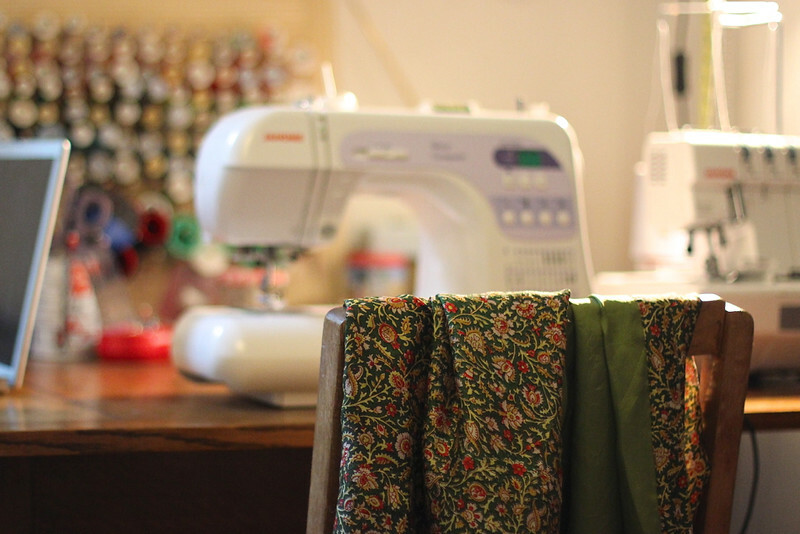 This whole skirt was sewn with a bonkers machine. The kind people at the shop are going to fix it for me, but I don't know how long it will take and I wanted my skirt finished!